Cherry season usually begins for us in mid May when we harvest the first of the Rainiers from 60+ year old trees the Cassanellis planted during the Depression. Too tall to throw nets over, we have a fight to the death with the Jays every year to see who will get more fruit. No contest this year as the last hard frost took out the entire crop. 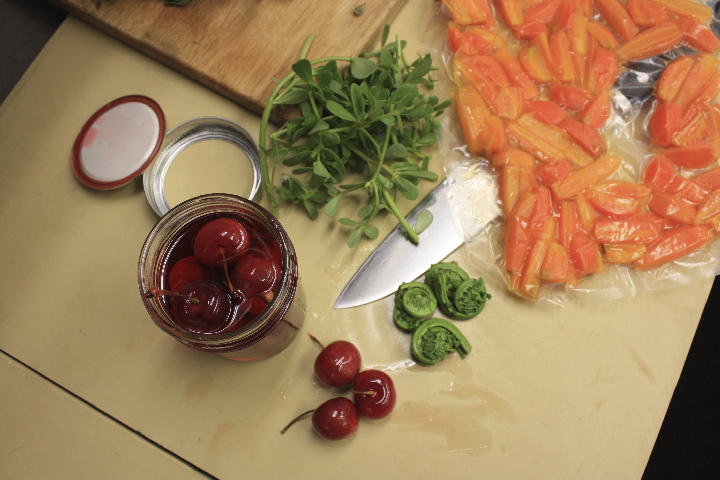 Whether you have an excess some years or not, with their thin permeable skin cherries take to macerating and pickling extremely well, and its a great way to extend their season. 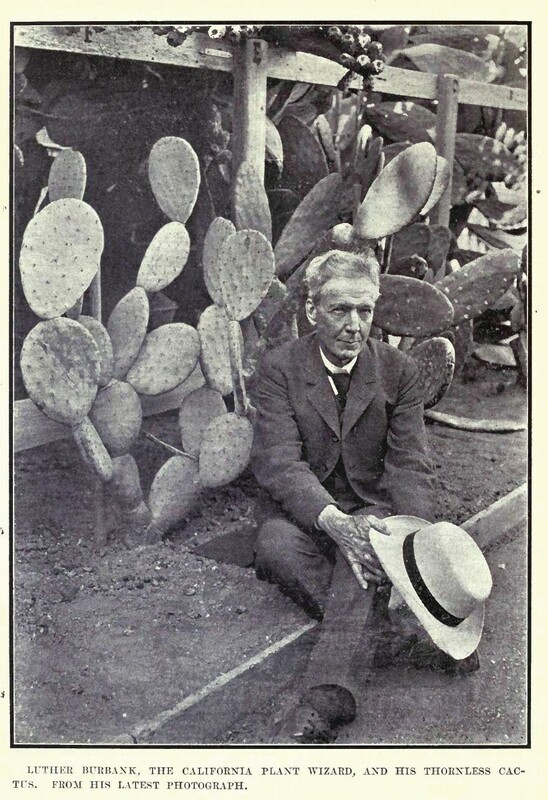 Even when the fruit is not stellar, depending on what you infuse them with, all sorts of unusual flavor convergences take place. 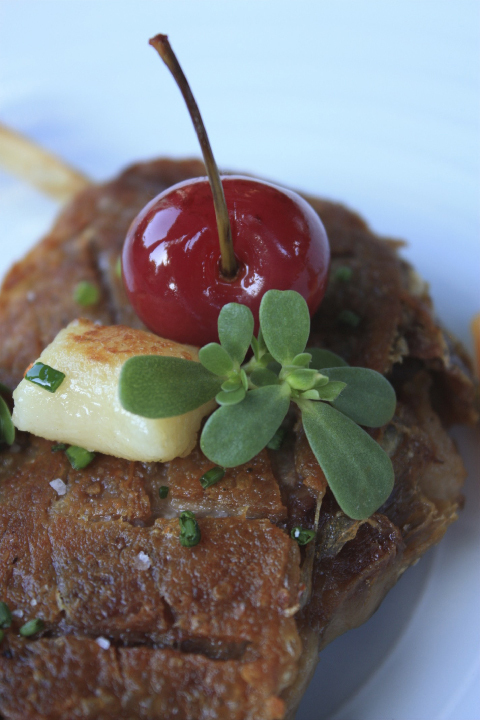 While duck and cherries have a classic affinity, too often traditional recipes that feature both go a ‘too sweet' route. While Chef's duck leg and thigh were quintessential French bistro ~ confit then pan seared to produce a perfect, crispy skin ~ he took the pairing in an unexpected direction this week when he used a surprising line-up of early summer produce to create a colorful conga line of flavors that incongruously, yet joyfully, played against form. The cherries, pickled in champagne vinegar with a bit of sugar, were a standout, with bright acidity and a nice pop, but each veg seemed to dance across the palate in a way that made the next in line a momentary headliner: sous vide Nantes carrots added sweetness and color; perfect fiddleheads spicy green notes; favas brought a fat melting texture; pickled baby red onions tasted oddly sweet compared to the sour punch packed by the cherries. Yukon Gold gnocchi, plump and savory, held the base note on all the other flavors. One of the lesser known stars of early summer ~ fresh purslane ~ graced the dish completely unadorned. 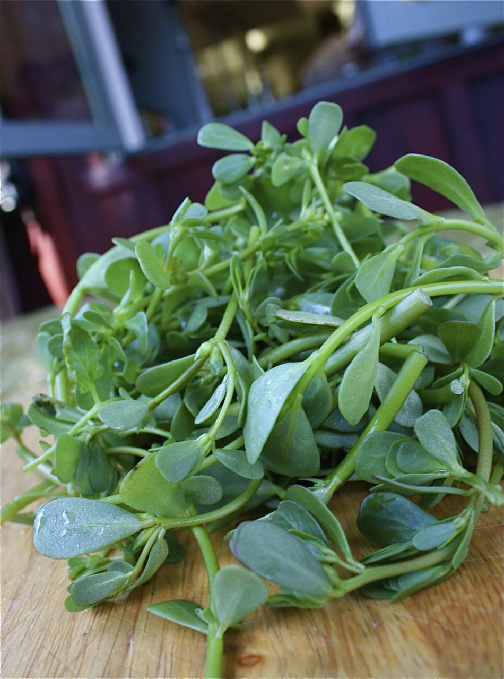 An edible succulent, purslane has the soft mouth feel of aloe and the snap on the teeth of a mature pea shoot. Its delicate flavor trails a wonderful green aroma. Not long after I shot these pictures I trundled off to a far corner of the garden to find a patch of sun and taste through the dish, my usual MO. At first I picked up each vegetable and studied it in the light like a snooty diamond buyer, but it wasn't long before I found myself tearing the skin off the duck with my fingers, mixing and matching flavor combinations, devouring every morsel. 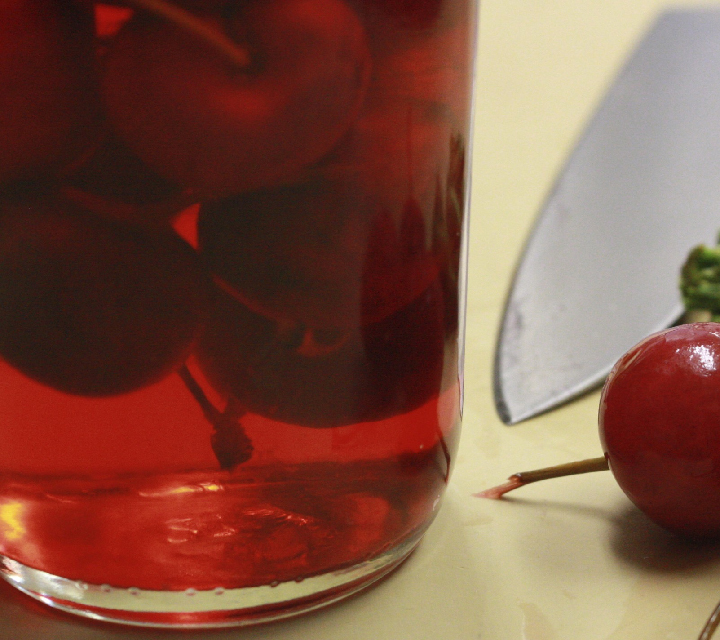 I saved the cherry for last. If you have ever wondered what we mean by 'eat the view,' our salutation since we opened Barndiva seven years ago and the name of this blog, come find out on Thursday when Barndiva will host the second annual Early Summer Farm Forum between 5-7. 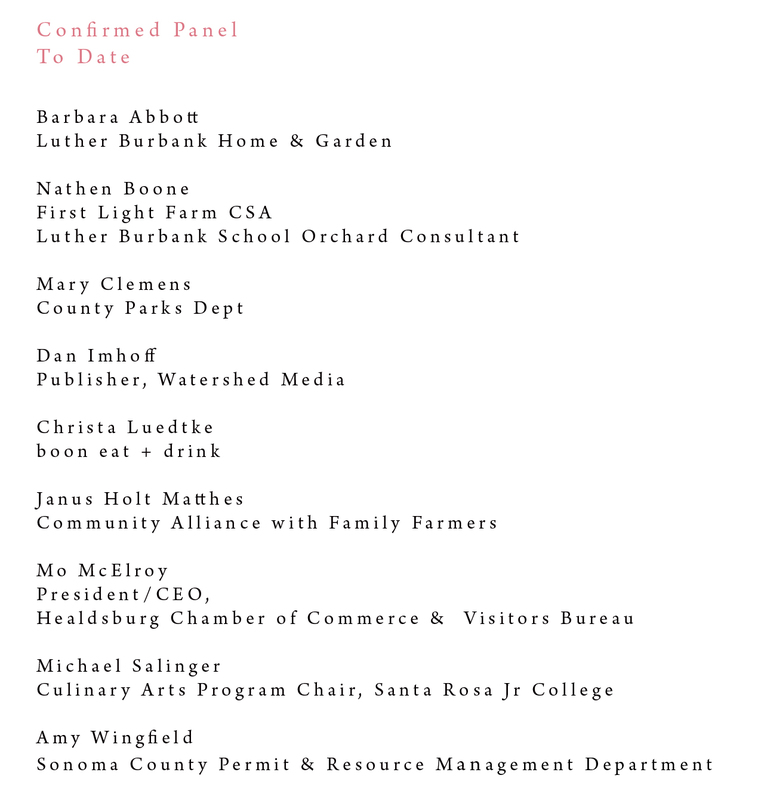 The estimable energies of Clark Wolf and Marcy Smothers have put together a truly dynamic panel of guests (below) who will talk and field questions about a range of food and farming subjects that touch our lives, whether or not you derive an income from the food shed. Think the upcoming farm bill is beyond us to have an effect upon? Think again. If you yearn to make a bit more sense out of the complex food related issues coming at us from all sides ..... or just want to come spend a beautiful afternoon of food, drink and thought provoking conversation with a very special group of friends, join us on Thursday. In every sense of the word, you won't go away hungry. The $15 entry will help fund more Luther Burbank Orchards and support Santa Rosa Jr College culinary projects. **For dinner reservations after the forum call 431-0100. All text Jil Hales. All photos, Jil Hales (unless otherwise noted).